The spa pump is the heart of your hot tub, but it may eventually need to be replaced due to overuse, age, overheating, water quality issues (high alkalinity damaging pump) etc. Sometimes you only need to replace part of the pump - like the wet ends, seals, impellers, etc. Hot Tub Outpost carries spa pumps and pump parts for all makes and models of hot tubs, as well as circulation pumps and blowers. We offer pump gaskets and o-rings as well. 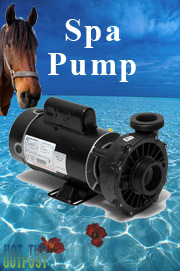 See our Century Pump Specials for the best deal in the West on brand name Spa Pumps. See our Spa Pumps listed below - including name brand, discounted pumps by Waterway and Aqua-Flo, as well as custom outfitted pumps and wet ends for your spa. Read our tips on finding a replacement spa pump.